I love this trilogy, and I'll debate with anyone who says that this book is a letdown. True, it is quite different from Titus Groan and Gormenghast, but Peake was, I think, attempting to portray a different atmosphere - a different world, even - than the world of Gormenghast. The titular castle was its own creature, with its own rules, its own political system, and even its own ecology. In fleeing his former home, Titus leaves behind his former life and soon realizes that life outside of Gormenghast bears no resemblance whatsoever to what he recognizes as life. 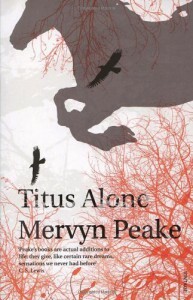 Titus is for all intents and purposes an alien, and Peake had to make the structure of this tale alien to that of the previous books in order to fully convey the sense of otherness which Titus is experiencing. The style of story has shifted from a sort of drawing-room fantasy to a drawing-room science fiction, but this is really superfluous to the themes which Peake touches on; freedom, exile, and madness. The pace was much quicker than in the two previous books, but I don't feel it suffered for that as the language was as gorgeous as ever. The feeling I got on completing this trilogy was a deep sense of satisfaction.